This article first appeared on legalitprofessionals.com. 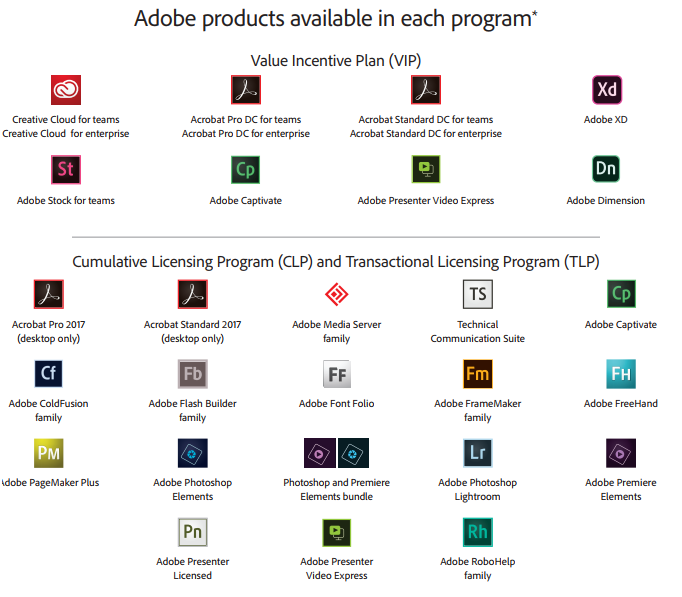 When buying Adobe licenses, one is presented with multiple options that fall under the category of either subscription-based licenses or perpetual software licenses. Here is a guide on how to choose. Value Incentive Plan (VIP), or the subscription-based license, is offered for clients who would like a year-to-year purchase. The VIP provides clients with resource flexibility as well as the availability of the latest available product. Some clients choose to go with this option because they can add licenses at will and additional licenses will be co-termed to the same end date. There are two plans offered for perpetual licenses: Adobe Cumulative Licensing Program (CLP) and Transactional Licensing Program (TLP). CLP is a two-year buying program in which the initial order of perpetual licenses allows for a discount level for both the initial and future purchases. Discounts are applied via a point system in tiers. By selecting this program, clients commit to a two-year volume licensing agreement. This program is best for larger organizations that wish to share their discount with their affiliates and subsidiaries globally. Another option for perpetual license is the Transactional Licensing Program (TLP), a one-time purchase for firms that value the simplicity of a buy, set, and forget process. TLP allows for volume licenses without a minimum order size and no membership. One of the benefits of TLP orders is that a single serial number per product (per order) is provided. During deployment, only one license key is needed for Adobe to be installed on each machine. Both options for perpetual licenses also allow for an upgrade of licenses to the newest version, given that the current version is only one version behind. For example, current users of Adobe Acrobat DC can purchase upgrade licenses to the new Adobe Acrobat 2017. Users on versions prior to DC will not be eligible to upgrade to the latest version. Kraft Kennedy has clients in all three of these programs. One small law firm chose to go with the year-to-year subscription VIP option as it was offered at a lower upfront cost. VIP licenses are named-user licenses, assigning Adobe apps and services to specific users as opposed to devices. As a new firm, this gave them the power to add licenses when adding new personnel as well as managing licenses and adding or reassigning users via an Admin console. Another client, a mid-sized firm, chose to go with the CLP option: perpetual licenses with a renewable 2-year upgrade plan. Their initial purchase allowed them to qualify for a volume discount as well as a discounted upgrade plan. Their upgrade plan will allow for them to access their latest product when available. Yet another mid-sized firm had purchased CLP licenses earlier this year to deploy the latest Adobe version to their entire firm. However, during the deployment of the product, we found it easier to deploy via TLP licenses as all the licenses would be provided on one serial. By adding the serial key to the client image, we were able to efficiently expedite the deployment across the firm. Feel free to reach out to us in order to find out which option works for you!